Successfully Added Digital Multimeter - 8 Function Edition to your Shopping Cart. New Digital Multimeter is an electronic measuring instrument that combines all your most commonly used measurement functions into one unit. This Multimeter comes with measurement and testing functions for voltage, current, resistance, continuity (connection between two points), testing diodes and temperature. This Digital Multimeter is a must have testing tool for your tool box, shed, garage, car trunk, etc. Its portability enables you to be able to take it with you wherever you go, and provides you with a multitude of features that helps you achieve the best results every time. 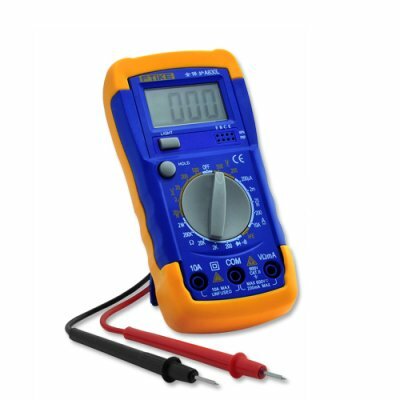 This hand-held Multimeter is also great for useful fault finding and field service work or as a bench instrument that measures to a very high degree of accuracy. It can be used to troubleshoot electrical problems in a wide array of industrial and household devices such as batteries, motor controls, appliances, power supplies, and wiring systems. This fully featured Multimeter with high resolution and accuracy, comes with a 1.8 inch LCD display with a table stand and testing cables, and is available with a factory-direct, low China Wholesale Price that just cannot be found anywhere else. Check Google - our price cannot be beat! Click "Add to Cart" now, and we'll express ship yours out within 24-hours. Does this digital Multimeter, have a power off safe mode? Yes, this function is built into the Multimeter device, that way if you forget to turn the Multimeter off, your battery will not drain of power, the Multimeter will simply turn it self off when left idle. Can this Multimeter be use to test connections on computer motherboards? Yes, this digital Multimeter can be used on any electronics device, this also included computer mother boards. A good quality robust product. Plastic is very thick. Very happy with product.